Schools of Summit, New Jersey » James Betelle, Where Are You? After completing my tour of CHS’s clock tower on a Saturday morning in April, I continued on to check out the Guilbert & Betelle schools built in the nearby town of Summit. The firm designed the high school and a number of grade schools, much as they did in South Orange and Maplewood, so I was curious to see how they compared. My first stop was the sprawling Lawton C. Johnson Summit Middle School, the former Summit High School (SHS), built in 1922 and expanded in 1927. There was a lot of activity on the grounds; baseball and soccer games, parents with kids and cameras streaming in and out of the building. I hardly looked out of place walking the perimeter with my own camera in hand, snapping away at the building. The school is interesting, as it reflects a distinct transition between Guilbert & Betelle’s early Jacobean-influenced designs to the later, more purely Gothic. SHS has all the standard elements of Collegiate Gothic; brick, limestone trim, gabled roof with bays, oriels, and a solid, crenelated central tower. 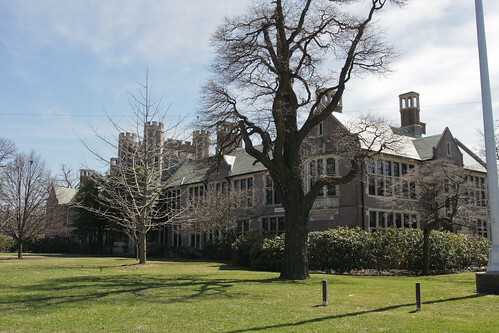 The main entrance does indeed have the classic pointed Tudor arch of a Collegiate structure, but it is the only one on the original building (a smaller side entrance from the 1927 addition has one). 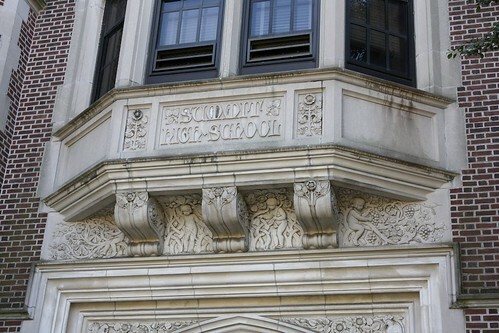 Details, such as the sculptural frieze and brackets over the main entrance aren’t Gothic at all. The Marshall School, also built in 1922, exhibits some of the same transitional characteristics. After exploring the exterior, I thought I would check out the front hall to see if there was a dedication plaque, and perhaps get a peek of the auditorium. The front door was locked (although I had seen people coming out of it), so I went to the side, where a modern entrance was carved into the 1927 facade. Families were streaming in and out, so I casually wandered in, with little worry I would be noticed. Puzzling for a moment how a set of steps are somehow unsafe for entrance and yet safe for egress, I changed by tactic a bit before this Abbott & Costello routine got out of control. With that, he finally pointed towards the hallway I was headed for anyway. The lobby wasn’t particularly interesting, but it was full of activity, with a show of some sort going on in the auditorium. Before checking that out, I did indeed find the dedication plaque by the front doors, which fittingly names Guilbert & Betelle as architects. I took a seat in the auditorium, having an oddly surreal feeling that I had snuck into the school, wandered its halls and was now seeing a show full of strangers. 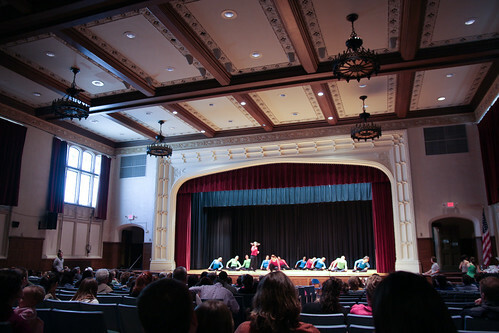 The hall was about a third full, with a modern dance performance by what appeared to be school moms. I tried to ignore it and spent a few minutes focusing on the design of the space. It has a fairly typical Tudor interior with particularly nice chandeliers and stained glass medallions in leaded windows. It’s a bit small by later standards for a high school auditorium, but certainly large enough for its current use as a middle school. Not wanting to overstay my non-welcome, I slipped out of the auditorium and left the building via the entrance that is not supposed to be an entrance. The steps didn’t look very dangerous to me. After the expanse of SHS, I was somewhat glad to be going by a few smaller schools. 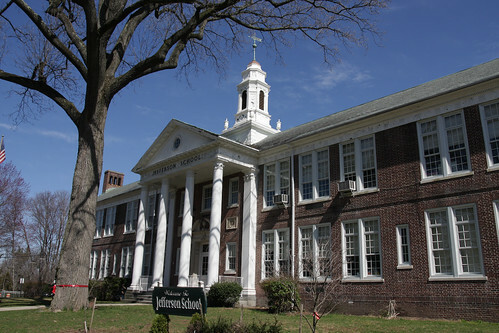 Unlike SHS, The Jefferson School was situated on the top of a hill in a purely residential area, lending the neighborhood charm that tends to favor grade schools. Jefferson, built in 1931, is a fairly typical example of Greek-Revival architecture. Jefferson has a rather large, handsome cupola, and features nicely-executed Georgian-style brickwork and railings. The only detractions are a rather deteriorated roof exterior in bad need of scraping, sealing and painting. Georgian-style railings and are nice touches to the side elevations. 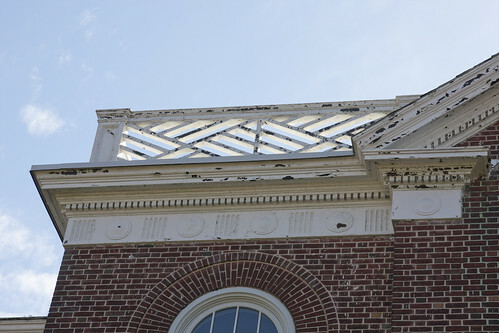 Jefferson’s lantern, pediment details and freize are clad in copper. The last stop on my Summit tour was the Franklin School, built in 1927. 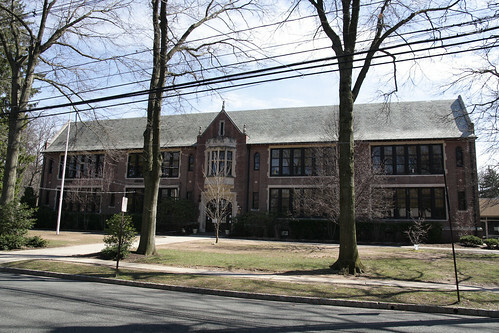 The school was in a neighborhood dense with vintage Tudor homes, making its Gothic design particularly appropriate. Franklin’s profile is similar to my own elementary school, South Mountain (which started this whole project in the first place). The interior arrangement are different, but the front elevation has the same basic centered Gothic gable end, entrance and bay window. Franklin has a number of unique details I liked. 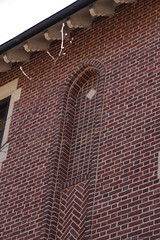 The eaves along the base of the roof, rather than the usual copper gutter, sport nearly Victorian-style brackets, and the Flemish-bond brickwork is punctuated by herringbone and other patterns not often found on more modest buildings. A detail I’ve not seen on any other structures by Guilbert & Betelle, are the inset “archer windows” that line the facade. Most surround narrow windows on the first and third floors, but one pair have blank tops accented with a diamond stone inset. It’s a small, but proud detail. One last thing at Franklin I noticed was the main entrance, which appear to have its original oak trim. Peeking inside the front hall, I saw that it also has a very nice original oak door screen. By the time I took these last photos, the low, late afternoon sun was in my eyes making good shots tricky. It was a long day, having started with a climb up a clock tower to surreptitiously peeking inside a school, so I was ready to pack it in. More photos can be found at my flickr set.